As important for handling chemicals as protective clothing, a composite hose is manufactured to the optimum levels of functionality so that they can last for the long-term. Intriguingly, these industrial hoses are engineered via computer to help with all the small details that are needed for the interlinking of all the various polypropylene films and fabrics. Relating to oil, petrol, paraffin and other highly volatile materials with many varying types (from Fuelmaster to Oilmaster) depending on the load that is necessary for transfer. Ideal for use in boatyards and heavy duty goods. 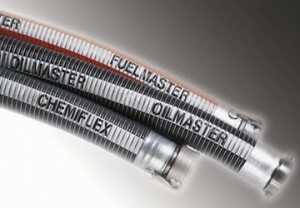 In the transportation of chemical goods, the Chemiflex hose assemblies are difficult to match. In tankers, the correct utilisation of hoses is vital for the safety of the driver and the load. Look to the heavy duty version for peace of mind or a lighter version for use elsewhere. Extreme temperatures are difficult to handle so with your goods which may reach degrees of -200°C, it’s vital that the correct hose assemblies are used at all times. Depending on the levels of cold, make sure you are well-prepared for the transferal of liquid nitrogen.